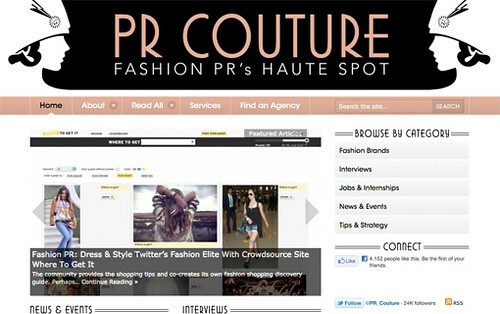 My New Favorite Blog Is….PR Couture! I stumbled upon this wonderful PR blog that focuses on a girl’s second best friend… FASHION! From cool tips for those new to the fashion PR industry, to job posts, to news about the latest trends with the biggest fashion and PR firms, this blog is heaven to those who love fashion and PR… Especially students and recent grads. Most everything is a choice — think of your career as a living, breathing relationship. Tend to it, nurture it, even love it, but don’t be afraid to get out if the situation is unsupportive, out-of-control, and painful. There are opportunities everywhere. This entry was posted on January 12, 2012 at 12:47 am and is filed under Blogs, Fashion, Social Media, Uncategorized with tags Blog, Breaking In, Crosby Noricks, Fashion, Graduates, Guide, Inspiration, Internships, jobs, PR Couture, public relations, Quotes, Students. You can follow any responses to this entry through the RSS 2.0 feed. You can leave a response, or trackback from your own site.